Monocytes are important mediators of arteriogenesis in the context of peripheral arterial disease. 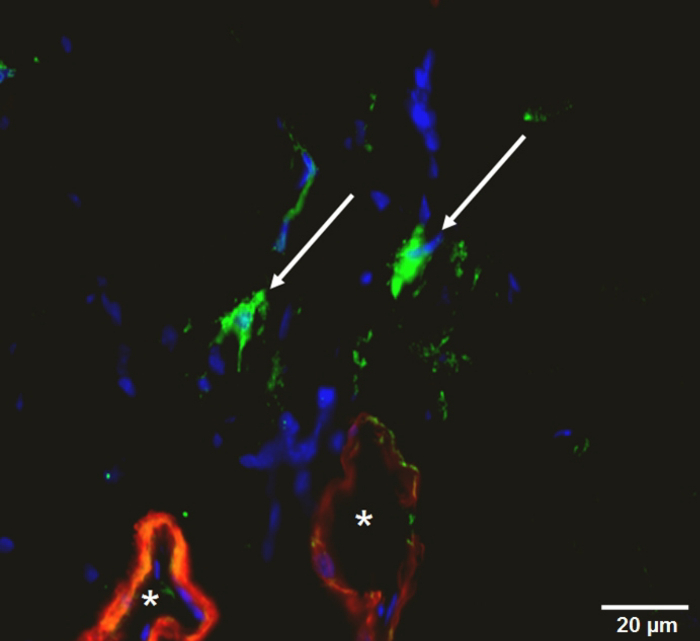 Using a basement membrane-like matrix and intravital microscopy, this protocol investigates monocyte homing and tumor-related angiogenesis after monocyte injection in the femoral artery ligation murine model. Wagner, M., Baer, C., Zuschratter, W., Riek-Burchardt, M., Deffge, C., Weinert, S., Lee, J. C., Braun-Dullaeus, R. C., Herold, J. Intravital Microscopy of Monocyte Homing and Tumor-Related Angiogenesis in a Murine Model of Peripheral Arterial Disease. J. Vis. Exp. (126), e56290, doi:10.3791/56290 (2017). The therapeutic goal for peripheral arterial disease and ischemic heart disease is to increase blood flow to ischemic areas caused by hemodynamic stenosis. Vascular surgery is a viable option in selected cases, but for patients without indications for surgery such as progression to rest pain, critical limb ischemia, or major disruptions to life or work, there are few possibilities for mitigating their disease. Cell therapy via monocyte-enhanced perfusion through the stimulation of collateral formation is one of a few non-invasive options. Our group examines arteriogenesis after monocyte transplantation into mice using the hindlimb ischemia model. Previously, we have demonstrated improvement in hindlimb perfusion using tetanus-stimulated syngeneic monocyte transplantation. In addition to the effects on the collateral formation, tumor growth could be affected by this therapy as well. To investigate these effects, we use a basement membrane-like matrix mouse model by injecting the extracellular matrix of the Engelbreth-Holm-Swarm sarcoma into the flank of the mouse, after occlusion of the femoral artery. After the artificial tumor studies, we use intravital microscopy to study in vivo tumor-angiogenesis and monocyte homing within collateral arteries. Previous studies have described the histological examination of animal models, which presupposes subsequent analysis to post-mortem artifacts. Our approach visualizes monocyte homing to areas of collateralization in real time sequences, is easy to perform, and investigates the process of arteriogenesis and tumor angiogenesis in vivo. Cardiovascular diseases, including coronary heart disease or peripheral arterial disease, are the most common causes of death globally1. Cell therapy is a promising approach to treat cardiovascular disease, particularly for people who are not able to undergo surgical interventions. There are several approaches to use cells or their secreted substances as a therapeutic tool2,3, with the overall goal to improve the perfusion and maintain function of ischemic and underperfused tissue. One attempt to achieve this goal is to improve arteriogenesis, which enhances the development of collateral arteries. Monocytes are an important cell type associated with collateralization. Our group has focused on researching the effects of monocytes in areas of inflammation4,5, in particular using the hindlimb ischemia model to induce ischemia and subsequent inflammation6. Monocytes home to areas of inflammation and cause complex systemic responses that lead to the development of collateralization7. With the use of intravital microscopy, we can study the behavior of these cells in vivo and observe the homing of injected monocytes to areas of inflammation. Most former studies only describe post mortem analyses, which hold disadvantages including an introduction of histological artifacts and large numbers of animal required for preparations. With our approach, we can investigate immunological processes and collateral formation via live imaging at multiple time points. In addition to the development of collateral arteries in ischemic areas, monocytes also influence tumor growth. To investigate these processes, we inject a basement membrane-like matrix extracted from the Engelbreth-Holm-Swarm mouse sarcoma, a tumor rich in extracellular matrix proteins8, and analyze using intravital microscopy. This matrix is used to screen test molecules for either endothelial cell network formation or anti-cancer therapies through angiogenic inhibition; in this case, we will assess the tumor angiogenic potential of monocytes for cell therapy9,10,11. The aim of this protocol is to demonstrate an easy and efficient way to study immunological processes caused by ischemia in an in vivo model. We can generate a more realistic test environment compared to histological workup of post mortem muscle tissue. Our study was performed with permission of the state of Saxony-Anhalt, Landesverwaltungsamt Halle, according to section 8 of the German law for animal protection. (§ 8, paragraph 1 of the German law for animal protection from 18.05.2016 - BGBI. I S. 1206, 1313, § 31 TierSchVersV from 13.08.2013). NOTE: For the experiments here, 8 to 12 week old male BALB/c mice were used, and human monocytes from blood donors were used for the visualization of monocytes via intravital microscopy. NOTE: When working with the cells all steps must be sterile to avoid contamination. Resuspend the cells in serum free culture medium with a density of 1 x 106 cells/mL. NOTE: Only serum free medium enables an efficient staining, since the lipophilic dye would otherwise already be captured by lipophilic components of the serum. Add 5 µL of 1 mM 3,3'-Dioctadecyloxacarbocyanine perchlorate in dimethylformamide to 1 mL of the cell suspension and resuspend carefully. Incubate the cell solution at 37 °C for 20 min. Centrifuge the cells at 37 °C and 500 x g for 5 min. Dislodge the supernatant and resuspend the cells with 37 °C warm fetal calf serum supplemented medium. Repeat the steps 1.1.4 and 1.1.5 twice. Resuspend the cells with 150 µL sterile 0.9% NaCl solution. Inject the cells into the tail vein. Vaporize isoflurane with the help of a vaporizer using a concentration of 5% in a closed bin under a chemical safety hood. Handle the mouse carefully and put it into the bin. Handle the animal by the skin of the posterior neck after it has stopped moving. NOTE: Use isoflurane anesthesia, described under step 2.1, to perform an intraperitoneal injection. 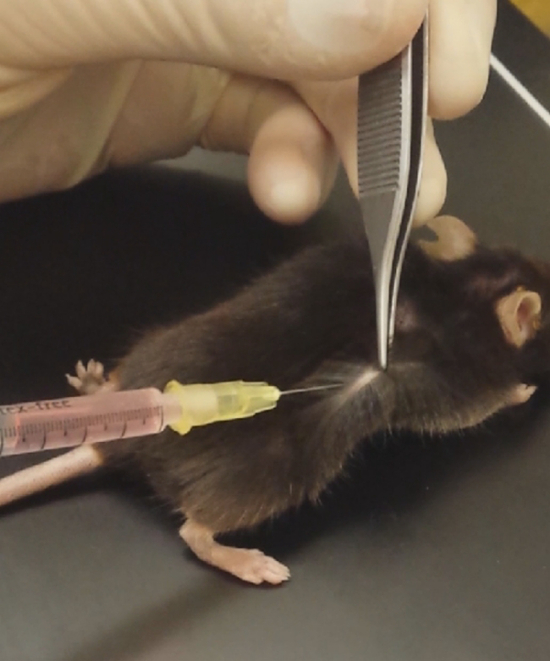 With the fast recovery and short-acting narcotic effect of the isoflurane anesthesia, it is easier to handle the mouse and inject intraperitoneal anesthesia. Use a solution of 2.4 mL Ketamine (10%), 0.8 mL Xylazine (2%), and 6.8 mL NaCl (0.9%) for the intraperitoneal injection. Weigh the animal before applying anesthetic. Use a 1 mL insulin syringe with a 30 G needle to inject the solution into the left underbelly. Place the mouse in its cage and wait for narcotic effect. NOTE: The narcotic effect normally appears within 5 min if the injection was successful. The correct depth of the anesthesia can be determined by the absence of either the lid reflex or reaction to toe pinch, as well as a regular, controlled rate of breathing. NOTE: This method is used by our group to study tumor angiogenesis after monocyte injection. Depending on the experiments, growth factors can be added to the basement membrane-like matrix. 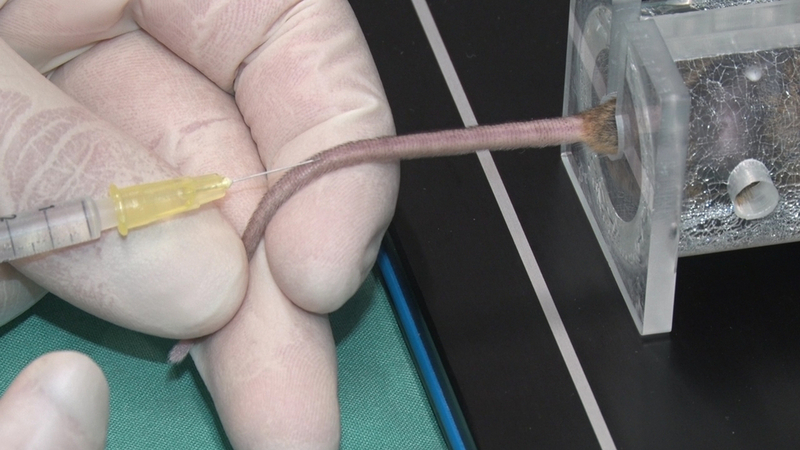 We performed femoral artery ligation before injecting the tumor in the flank of the mouse. The matrix must have a temperature of 4 °C for the injection. At this temperature, the matrix is fluid; the gel hardens to a solid at body temperature (37 °C). For better visibility of the subcutaneous matrix plug, shave the skin of the mouse at the injection site. Note:Optional: Add 100 ng basic fibroblast growth factor, 300 ng vascular endothelial growth factor, and 26 I.U. heparin under sterile conditions to the basement membrane-like matrix. Load 1 mL of matrix into a 30 G insulin syringe and store on ice until use. Lay the animal on the table and hold the skin of the mouse next to the injection site on the flank. Inject 500 µL of the basement membrane-like matrix subcutaneously. NOTE: For practical reasons, it is necessary to inject the basement membrane-like matrix compactly at one location to avoid subcutaneous dispersion. It will be easier to dislodge the artificial tumor from the tissue after sacrificing the mouse at the end of the experiment. NOTE: Practice the tail vein injection with NaCl solution on test animals before experimentation. If the monocytes cannot be adequately injected in the tail vein, there will be no systemic effect on the collateralization. In this protocol, we injected 2.5 million monocytes. Try to inject no more than 5 µL/g of bodyweight. Use the monocyte solution prepared under step 1.1.8 containing 2.5 million monocytes. Use a 30 G needle and a 1 mL insulin syringe for the injection. Carefully handle the mouse, restrain the animal in the restrainer, and make sure the mouse is not harmed and has adequate space for breathing. Put the restrainer on the heating pad so that the tail can contact the plate. Identify the tail veins, which are located on the lateral side of the tail. Turn the tail 90 °, so the tail vein appears on the upper side of the tail. Disinfect the injection side before injecting the monocytes. Try to inject the monocyte solution in a flat angle with the bevel of the needle facing up. NOTE: Stop the injection if a blister appears, as this is a sign of a failed injection. Attempt the procedure again more proximally. Stop bleeding at the injection site by applying gentle pressure on the tail for about 60s. Observe the animal for 30 min to monitor for systemic side effects and place the mouse in its cage after the animal has fully recovered. Place the anesthetized mouse on the heating pad (37 °C) to keep a constant temperature and fix the paws in place with adhesive tape. Disinfect the skin at the site of the leg or flank that is used for microscopy. Shave the region of interest for better handling and to avoid interference with hair. Excise the skin with a sterile scalpel and fine forceps in a square area of 0.5 x 0.5 cm. NOTE: It is important to keep the region of interest moist; otherwise, the quality of images and tissue will be compromised. NaCl solution can be used to moisten the area. Place the leg between two adjustable stamps and position a cover glass on top of the stamps. Ensure the tissue is wet and is in contact with the glass. Inject 50 µL rhodamine dextran retrobulbar into the venous system for better visibility of the vessels. Start microscopy and adjust the position of the leg if needed. Turn on the microscope, computer, electronic interfaces, and lasers. Turn on the heating unit of incubation chamber and/or heating stage (plate/pad), and set the temperature to 37 °C. Start the acquisition software. If the microscope is equipped with a resonant scanner, select this fast scanning mode. NOTE: A stable temperature is important for: (a) the mouse, which under anesthesia cannot control its body temperature, and (b) avoiding or at least minimizing focal drift. 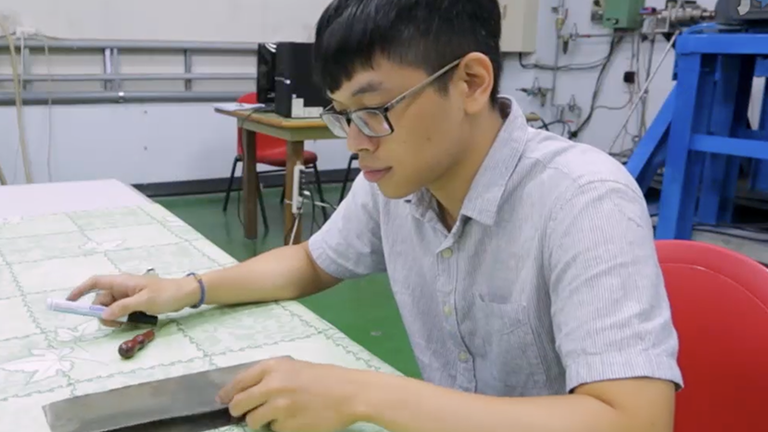 This could take 1 h to several hours, depending on the surrounding conditions (e.g., air conditioning system and the number of heat sources in the room, including people). If immersion objectives are used, the contact zone between the lens and cover glass (or tissue) is a typical source of instability. Heating the lens with an objective heater may help; alternatively, a microscope with an autofocus system is highly recommended. Select a magnification lens with a high numeral aperture that fulfils the resolution requirements of the experiment (see note at the end of this section). Optimize the microscope settings with respect to gain, channel settings, scan speed, pixel resolution, depth volume, step size, and averaging before placing the experimental animal on the stage. Scan bidirectionally to reduce acquisition time. Place the anesthetized mouse on the prewarmed microscope stage after the microscope has reached stable conditions and the settings have been tested with the help of a dummy. Bring the region of interest within the basement membrane-like matrix into focus by using bright light illumination and inspect briefly the capillaries by ultraviolet light with adequate filter settings for the applied fluorophores. Switch to scanning mode; start scanning at low resolution 256 x 256 mode and enhance gain and laser power until a signal is observed on the monitor. Focus on the structure of interest. Zoom in until all details are visible. Define "start" and "end" positions in the axial direction. Define stepping size (e.g., 0.5 µm) and number of focal planes (e.g., 10 - 20). Switch to the final pixel resolution (512 x 512 or 1,024 x 1,024) depending on the speed of the moving subcellular structures or cells and select the scan speed (scan frequency) that fits best to the movements. Bidirectional scanning is recommended to fasten the acquisition of stacks. NOTE: Select the highest scan rate of scanning that gives sufficient image quality. Typical point scanners provide speeds between 400 Hz and 1.4 kHz. Resonant scanners provide an additional 8 kHz or 12 kHz. By reducing the number of lines in the y-direction, the scan rate can be further increased (typical values are 512 x 512, 512 x 256, or 512 x 200 pixel resolution). Depending on the signal-to-noise ratio, one can try to improve the image quality by adding line averaging between 2 and 4. Typically, a setting of 512 x 200 with no averaging results in an acquisition time/frame of 18 ms in the bidirectional mode with an 8 KHz resonant scanner; with 512 x 200 and 4x averaging, it slows down to 56 ms per frame. Intravital microscopy for the examination of tumor and collateral vessel growth triggered by monocytes can help reveal new aspects in the molecular mechanisms of tumor angiogenesis and arteriogenesis. Cells must be prepared and injected carefully using the steps of the protocol. Differences can lead to variations between single experiments. The monocytes must be injected into the venous system (Figure 1) to maintain systemic effects and avoid emboli, which can occur if the injection is conducted in the arterial system. If basement membrane-like matrix is used, injecting slowly to avoid dispersion will help with plug explantation for further histological examination (Figure 2, Figure 3). After sacrificing the mouse, the basement membrane-like matrix plug will be explanted from the flank of the mouse. Within the basement membrane-like matrix plug, we can measure vascularization by counting capillaries within different experimental settings (Figure 4, Figure 5). Another condition for successful experiments is the microscope setting, which depends on software, hardware, and animal preparation (Figure 6). If subcellular structures (<2 µm) need to be identified, an upright microscope with 2-Photon-excitation and water immersion objectives (20X or 25X, numeral aperture 1.0) with long working distance (>2 mm) are advisable. Since water immersion objectives with high numeral aperture are extremely sensitive to refractive index variations, the optimal image resolution and brightness must be adjusted by moving a correction collar at the objective. Unfortunately, adjustment by hand is quite difficult due to limited space. Therefore, expensive objectives with a motorized collar correction are offered by microscope manufacturers. If cellular resolution (5 - 10 µm) is sufficient, a 10x dry lens with a numeral aperture 0.4 or higher and a long working distance (>2 mm) is recommended. In this case, an upright or an inverted microscope stand can be selected. Live cell imaging with a 10X dry lens (numeral aperture 0.4) at higher zoom factors (>3) is much easier and cheaper because classical confocal laser scanning microscopy (i.e., 1 Photon excitation) can be used to obtain image stacks with sufficient resolution. If much time is required for the acquisition of images, the amount of rhodamine dextran within the vessel decreases. For a better visibility of the vessels, the injection of the fluorophore must be repeated (Figure 7). It is most effective to sample different adjustments and decide the best image quality possible. The use of positive probes for cells or basement membrane-like matrix (without transplantation) can help obtain optimal settings. We could detect labeled monocytes via intravital microcopy within the blood flow and muscle tissue (Figure 8, Figure 9). Histological examination of tissue sections verifies our findings (Figure 10). Figure 1: Injection of 2.5 million monocytes into the tail vein. Veins are located on the lateral side of the tail, with arteries on the dorsal and ventral side. Please click here to view a larger version of this figure. Figure 2: Injection of basement membrane-like matrix. Handle the skin of the mouse and inject the basement membrane-like matrix in the flank. Please click here to view a larger version of this figure. Figure 3: Explanted matrix plug from the flank of the mouse (see point 3.5). Incorporated vessels five days after monocyte transplantation via the tail vein. Please click here to view a larger version of this figure. 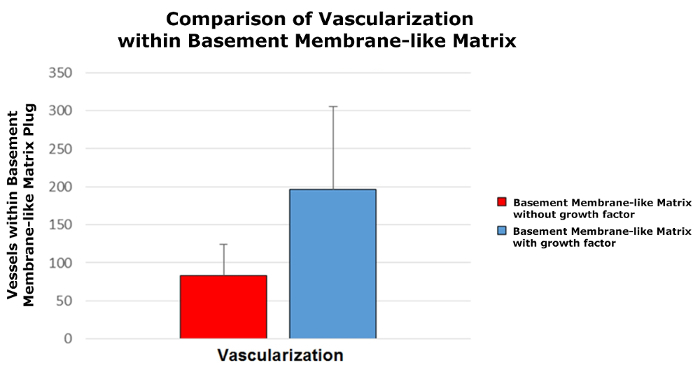 Figure 4: Comparison of vascularization within the basement membrane-like matrix ( + SD, n = 3 in each group). Vessels within the basement membrane-like matrix plug, with no growth factor added (red bar), compared to vessels of basement membrane-like matrix plug with growth factor added. The supplementation of basement membrane-like matrix with growth factor leads to increased vessel growth. Please click here to view a larger version of this figure. Figure 5: Vessels within the basement membrane-like matrix plug. 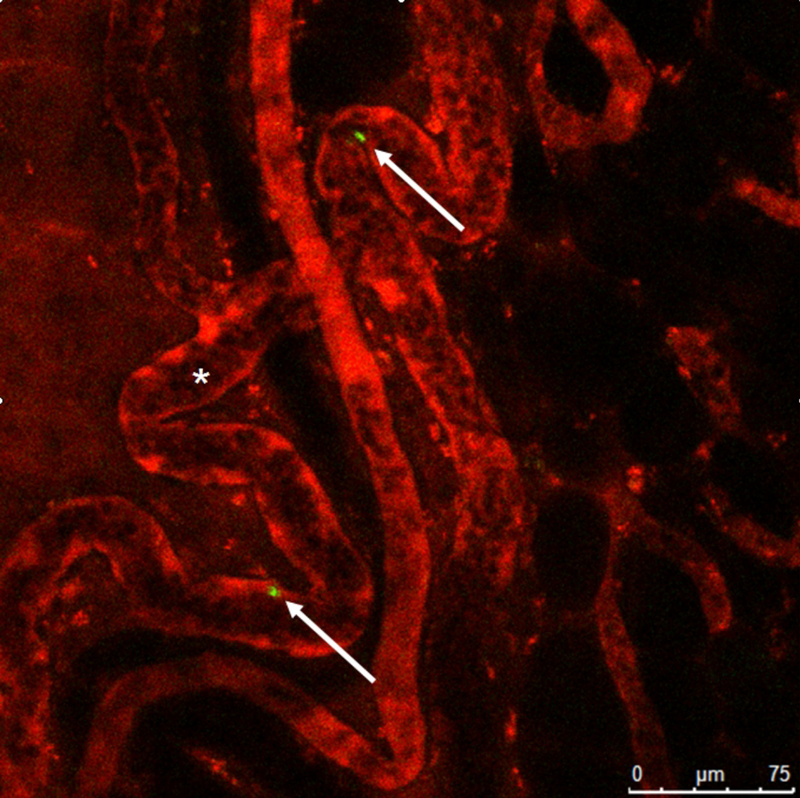 Visualization of blood flow (red) within vessels (arrows) and monocyte homing (green) within the basement membrane-like matrix plug. Please click here to view a larger version of this figure. 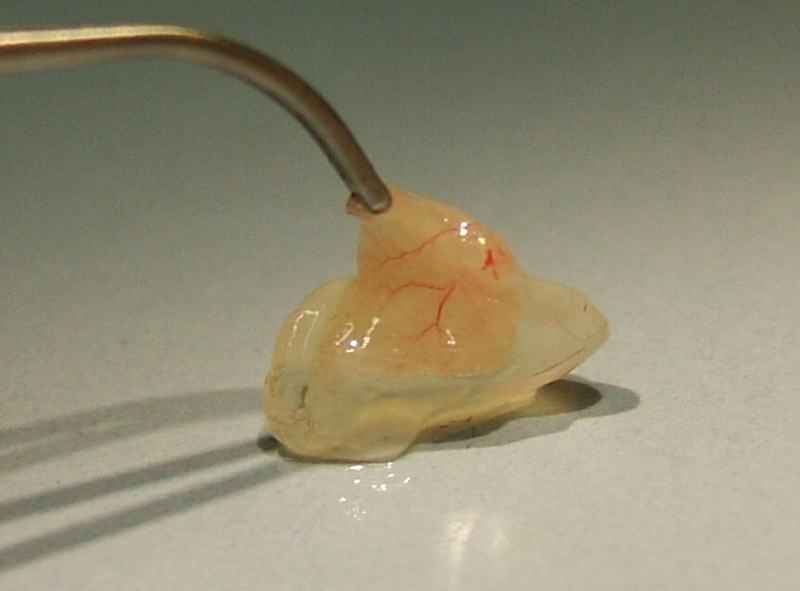 Figure 6: Mouse prepared for image acquisition. The paws are fixed with adhesive tape and a cover glass is positioned on the top of two adjustable stamps. The region of interest was excised with a scalpel. NaCl is used to moisten the area so the quality of images and tissue will not be compromised. Please click here to view a larger version of this figure. Figure 7: Decreased visibility of vessels. 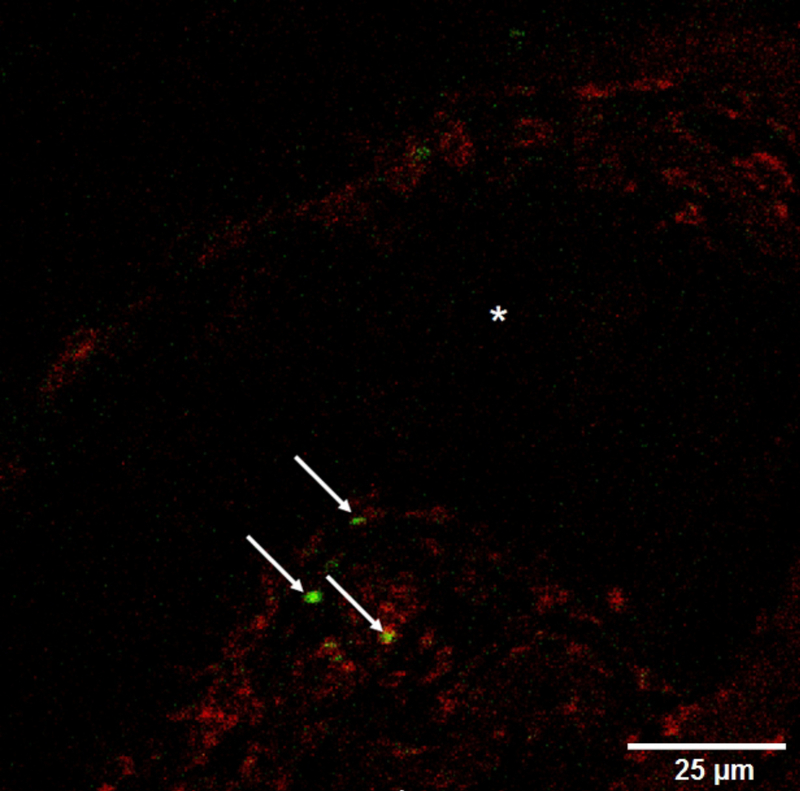 3,3'-Dioctadecyloxacarbocyanine perchlorate stained monocytes (arrows) within basement membrane-like matrix next to a vessel (longitudinal section, *). Please click here to view a larger version of this figure. Figure 8: Monocyte flushed into vessel. In vivo visualization of 3,3'-Dioctadecyloxacarbocyanine perchlorate stained and transplanted monocyte (green, arrow) within the collateral artery (*). Please click here to view a larger version of this figure. Figure 9: Intravital microscopy. 3,3'-Dioctadecyloxacarbocyanine perchlorate stained monocytes (arrows) within collateral vessels with typical corkscrew formation (*) stained with rhodamine dextran. Please click here to view a larger version of this figure. Figure 10: Immunohistological staining of thigh musculature. Vessels (red: alpha smooth muscle actin, *), macrophages (green: 3,3'-Dioctadecyloxacarbocyanine perchlorate, arrows), cell nucleus (blue). Please click here to view a larger version of this figure. The method described here sheds light on the development of collateral arteries, the behavior of monocytes in these vessels, and the process of arteriogenesis. The steps for applying this protocol are easy to learn and can be used in other fields of science. Despite these advantages, there are some disadvantages. For instance, microscopic equipment is required to execute the described techniques. Obtaining equipment for one experiment is unsustainable, so it is important to collaborate with other institutions to share the devices. There are other difficulties connected with this protocol that can be avoided with practice. In the beginning, there can be problems with positioning the mouse under the microscope, and image quality can suffer under these circumstances. Another critical point is the tail vein injection. Monocytes can only be seen in the veins if injected properly. Therefore, it is advisable to practice the injection before positioning the mouse. Monocyte isolation is also critical. Monocytes can be isolated from different species using multiple protocols, which often lead to various results and cell yields12,13,14. It is necessary to work in sterile conditions to avoid contamination. Cell damage should be prevented by pipetting carefully and maintaining constant temperatures. Despite these disadvantages, this method is practical and easy to perform, enabling users to shed light on tumor angiogenesis and the basic mechanisms behind peripheral arterial disease. This work was supported by the ELSE-Kröner-Stiftung and the DFG (Deutsche Forschungsgemeinschaft, German Research Foundation) SFB 854 (Sonderforschungsbereich, collaborative research center). Special thanks to Hans-Holger Gärtner, Audiovisuelles Medienzentrum, Otto-von-Guericke University Magdeburg, Magdeburg, Germany, for technical support. World Health Organization. WHO | The top 10 causes of death. World Health Organization. http://www.who.int/mediacentre/factsheets/fs310/en/. (2017). Volz, K. S., Miljan, E., Khoo, A., Cooke, J. P. Development of pluripotent stem cells for vascular therapy. Vascular pharmacology. 56, (5-6), 288-296 (2012). Henry, T. D., et al. The VIVA trial: Vascular endothelial growth factor in Ischemia for Vascular Angiogenesis. Circulation. 107, (10), 1359-1365 (2003). Wagner, M., et al. Isolation and intravenous injection of murine bone marrow derived monocytes. Journal of visualized experiments JoVE. (94), (2014). Herold, J., et al. Transplantation of monocytes: a novel strategy for in vivo augmentation of collateral vessel growth. Human gene therapy. 15, (1), 1-12 (2004). Ito, W. D., Arras, M., Scholz, D., Winkler, B., Htun, P., Schaper, W. Angiogenesis but not collateral growth is associated with ischemia after femoral artery occlusion. The American journal of physiology. 273, (3 Pt 2), H1255-H1265 (1997). Eubank, T. D., Galloway, M., Montague, C. M., Waldman, W. J., Marsh, C. B. M-CSF induces vascular endothelial growth factor production and angiogenic activity from human monocytes. Journal of immunology (Baltimore, Md. 1950). 171, (5), 2637-2643 (2003). Fridman, R., et al. Enhanced tumor growth of both primary and established human and murine tumor cells in athymic mice after coinjection with Matrigel. Journal of the National Cancer Institute. 83, (11), 769-774 (1991). Woodman, S. E., et al. Caveolin-1 knockout mice show an impaired angiogenic response to exogenous stimuli. The American journal of pathology. 162, (6), 2059-2068 (2003). Houthuys, E., Movahedi, K., Baetselier, P., de Van Ginderachter, J. oA., Brouckaert, P. A method for the isolation and purification of mouse peripheral blood monocytes. J. Immunol. Methods. 359, (1-2), 1-10 (2010).